Miso | Become Healthy or Extinct! Miso is traditional Japanese fermented food that chefs and food aficionados prize for its rich, complex flavor and its ability to add an extra heartiness to nearly any dish. Natural health advocates love miso for its dense concentration of nutrients and its remarkable disease-fighting properties. The most common type of miso is made from a fermented paste of soybeans, often with other ingredients. 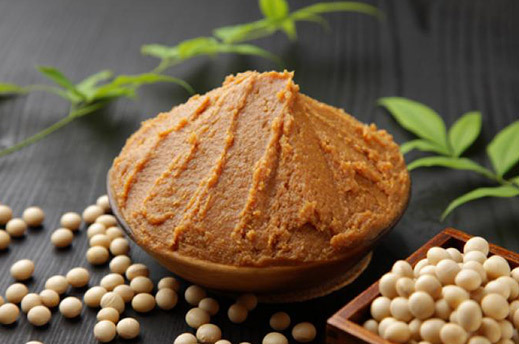 Overall, miso has a salty taste and a texture similar to nut butter, though the specifics vary depending upon the ingredients and length of fermentation. The most popular varieties of miso include hatcho (made with soy only), genmai (made with soy and brown rice), kome (made soy and white rice), mugi (made with soy and barley), natto (made with soy and ginger) and soba (made with soy and buckwheat). Claims that miso is high in vitamin B have been contradicted in some studies. Some experts suggest that miso is a source of Lactobacillus acidophilus. Miso is relatively high in salt which can contribute to increased blood pressure in the small percentage of the population with sodium-sensitive prehypertension or hypertension. Miso is unusually rich in nutrients, due in part due to the fermentation process required to produce it. This process breaks down the complex and sometimes hard to digest oils, proteins and carbohydrates found in soybeans into forms more easy for the human body to digest. In addition, the final product (assuming it is unpasteurized) contains live lactobacilli, which also enhance your body’s ability to extract nutrients from food. The nutrients found in miso include vitamin B2, vitamin E, vitamin K, calcium, iron, potassium, choline and lecithin. Miso is also high in dietary fiber and provides a large amount of complete protein. It is especially high in polyunsaturated fats, which the FDA has endorsed for their ability to lower the body’s levels of LDL (“bad”) cholesterol. One of these facts, linoleic acid, actually helps keep skin soft and young-looking. But miso’s health-boosting effects are not limited to its high nutrient content. Like other fermented foods, miso increases the concentrations of beneficial bacteria in the digestive tract. These probiotic organisms don’t just aid in digestion, but also play an important role in maintaining and strengthening the immune system. Miso is also particularly high in antioxidants, which remove dangerous free radicals from the body. Free radicals are cell-destroying chemicals that have been linked to degenerative diseases, cancer, cardiovascular disease, diabetes, and even the effects of aging. Genisten, one of the antioxidants found in soy products such as miso, has actually been shown in the laboratory to inhibit the growth and spread of cancerous cells. Thus it’s no surprise to find that regular consumption of miso – as is common in Japan, with many residents eating one bowl of miso soup per day – has been found to reduce the risk of breast, colon, lung and prostate cancer, among other health conditions. Miso consumption even appears to offer some protection against the effects of radiation. It’s easy to increase the amount of miso in your diet with minimal change to your cooking habits. Miso soup takes only minutes to make, or you can simply add miso to many of your favorite recipes – preferably after cooking, to preserve its probiotic effects.